Back in 2008, at the onset of the derivatives and credit collapse, I wrote several economic editorials discussing what I saw as the single most vital trend in the global fiscal system, and how it would cause a disastrous upheaval that would leave the U.S. and the dollar financially sunk. For the past decade, China has been slowly but surely issuing Yuan-denominated bonds and securities around the globe, while simultaneously forming bilateral trade agreements with multiple nations and cutting out the U.S. dollar as the world reserve currency. This process has gone mostly ignored by the mainstream financial media. However, I and many other independent analysts could not overlook the red flags. The biggest question for me was, if China is one of the largest holders of Forex reserves on the planet, and had the largest savings of any nation, WHY did they feel the need or desire in 2005 to begin issuing Yuan-denominated debt? Why begin borrowing capital from foreign creditors? They certainly didn’t need the money. Why were they moving away from export dependency and building a consumer base? And why attempt to proliferate their currency? Wouldn’t the pursuit of global Yuan circulation lead to an eventual increase in valuation? Didn’t the Chinese want their currency cheap so that they could maintain export superiority? What did the Chinese know in 2005 that we didn’t? 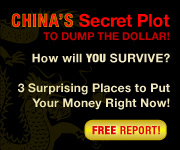 China is flooding the system with Yuan! This means only one thing; China is no longer seeking to maintain the traditional trade relationship it has had with the United States. To make my case even more clear, I would point out that China has not only become the world’s largest gold producer, but also its largest BUYER, recently surpassing India. Official estimates place Chinese gold purchases in 2012 at around 800 tons; an astonishing increase in their stockpile. The U.S. and the Federal Reserve can’t even deliver gold it is supposed to be holding for others, including Germany. China has also recently quadrupled imports of rice and tripled wheat and corn imports in only one year. Why? Again, I ask, what do they know that we are not being told? It is remarkable that an economy that is only a fraction of the size of the U.S. economy has a larger trading volume,” Nicholas Lardy, a senior fellow at the Peterson Institute for International Economics in Washington, said in an e-mail. “The surpassing of the U.S. is not because of a substantially undervalued currency that has led to an export boom,” said Lardy, noting that Chinese imports have grown more rapidly than exports since 2007. According to O’Neill (Goldman Sachs Jim O’Neill), the trade figures underscore the need to draw China further into the global financial and trading architecture that the U.S. helped create. For those who are still not aware of why this is such a big deal, it is essentially a turning point moment in global trade. There is no doubt that China will now be inducted into the SDR, and that their importance as a trade and consumption center will quickly lead to a move away from the dollar. To put it simply, the dollar is going to lose its world reserve status VERY soon. Many will cheer this change as necessary progress towards a more “globally conscious” economic system. However, it’s not that simple. Total centralization is first and foremost the dream of idiots, and in any mutation (or amputation) there is always considerable pain involved. The proponents of this “New World Order” (their words, not mine) seem to have placed the U.S. squarely in their crosshairs as the primary recipient of this fiscal pain. In my early analysis, I felt it possible that Japan would be inducted willingly into the new ASEAN trading bloc and that they would swiftly fall in line with a dump of the dollar, mainly because their export markets were suffering greatly due to the decline in American purchases. Now it appears that Japan has not been as pliable as the globalists wanted, and so, a war may be on the table in the Pacific. Rhetoric in Chinese newspapers has been very heated and provocative, and the tensions surrounding the Senkaku/Diaoyu Islands is reaching a boiling point. The two countries have done everything so far EXCEPT shoot at each other, and that will be happening in due course now that China is allegedly locking offensive radar onto Japanese ships. Even Chinese films released in the past two years have been soaked with anti-Japan propaganda, most of them usually set during WWII around the brutal invasion and subjugation by the Japanese in Chinese provinces. The recipe is one of inevitable disaster, with the U.S. at the center of a boiling pot. As I pointed in my last economic piece, we must now look to events rather than numbers to gain insight into where we are headed. The time has come. China is nearly ready for IMF inclusion. Volatility around the world is high. Our government has a final decision to make on the Fiscal Cliff in March, not to mention the sudden push for possible gun registration and confiscation. My instincts tell me that so many explosive aspects coalescing together at the same tenuous moment is not a coincidence. The next few months call for hyper-vigilance and every ounce of energy we can muster to educate as many people as possible in as short a time as possible. Be the first to comment on "This Is It! China Surpasses U.S. As Number One Global Trading Power"